It’s always a perfect weather for a yoghurt. 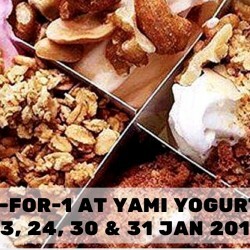 Enjoy a 1 for 1 treat from YAMI Yogurt at ION Orchard only on 23, 24, 30 and 31 January 2016. Redeem it from the ION Orchard app now! If you are a OCBC cardmember, download OCBC WowDeals mobile app now for exclusive deals! OCBC is rewarding their customers with 20,000 Free Cups of YAMI Yogurt (small) if you reserve this deal from now till 20 September 2015 on their WowDeals mobile app! Grab it now! Enjoy with YAMI Yogurt’s THP Special is back this GSS season! Beat the heat with YAMI Yogurt’s Great Shopping Savings offer Valid from now till 28 Jun 2015 THP Special. Buy 2 Take Home Packs (THP) for only S$22.00 (U.P. S$25.80).